Photographer LaToya Ruby Frazier’s new book The Notion of Family is a powerful visual chronicle of historic steel town, Braddock, Pennsylvania. It’s also an intimate portrait of the artist’s own family, Braddock natives who witnessed its boom, decline and — in recent years — its rebranding as an icon of Rust Belt renewal and destination for the so-called creative class. 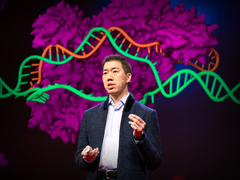 Frazier, who’s a TED Fellow, talked to Karen Eng about the origins of this ambitious project. Tell us about the people in The Notion of Family. The book features my grandmother, mother, and me, and looks through the three of our lives as people who grew up in three different social and economic periods in Braddock. Each one of us represents a different time period. My grandmother grew up in the 1930s when it was prosperous and had everything going for it; my mother grew up in the 1960s when there was the white flight, segregation; and I grew up there in the 1980s, once the factories were dismantled and the town itself was left kind of abandoned, economically. Grandma Ruby and Me 2005, from “The Notion of Family” (Aperture 2014). You said in your talk that by the 1970s most of the steel mills were gone — but there is one mill left, the Edgar Thomson Steel Works. Yes, it’s a historic steel mill; it was the first in the region and the last one still in operation. Braddock is not post-industrial the way people like to talk about in the mainstream media. The narrative there is that it’s a new frontier — that “urban pioneers” should come forth and reclaim the land and open up restaurants and art studios. But in reality, people have been there for generations, and are still trying to exist within a framework of industry and environmental degradation. No one trying to redevelop the land wants to talk about the EPA levels there, or the fact that it’s a Superfund site, or a brownfield. So the environment’s eroding — and so are our bodies, from our terminal illnesses. Has your own family suffered from illness? Many people in the community have died from different types of cancer. My grandmother died from diabetes and pancreatic cancer. My mother suffers from an unknown neurological disorder. I myself have lupus — I’ve been battling it most of my life. A lot of the portraits in the book show this: they are taken after surgery, before surgery, during lupus attacks. The steel industry is still there polluting the town. Meanwhile, community hospitals in working class communities that are predominantly made up of elderly people, single parent households, and African-American communities are being dismantled. And you don’t see the media telling this story? My work isn’t just counter-narrative. There are parallel realities in this town. I see my work as telling a longer, sustained story covering material that the mainstream press doesn’t have time for. They come in and out, they tell the quickest highlighted story they can, and they go. It’s creative class versus working class. I come from both, as an artist who comes from an impoverished working class background. So in a way, I stand in that gap as a witness to both. My hope is that the same resources that are available to the privileged creative class will become available to the working class. They should not be pitted against each other. “For the past 12 years, my mother and I have made collaborative portraits together, disrupting the idea that the privileged photographer comes from the outside,” says LaToya Ruby Frazier. Mom Relaxing My Hair 2005, from “The Notion of Family” (Aperture 2014). In 1999, during my first undergraduate photo class at Edinboro University of Pennsylvania, we were given an assignment based on philosopher Roland Barthes’ idea that in a photograph, there’s a “punctum” and a “studium.” A punctum is the thing in the photograph that pricks you, that wounds you, that gives you some emotional charge. And the studium is the subject. The assignment was to bring in a photograph that had both. One of the examples that was passed around in the classroom was Dorothea Lange’s iconic image Migrant Mother. Everyone kept calling it “Dorothea Lange’s photograph.” The image was passed to me — and I realized I didn’t know that woman’s name. So I brought that up. “Who’s the woman in the photograph?” None of us knew. In that moment it just hit me. This is an iconic image, but we don’t know the woman’s name in the photograph, we only talk about the photographer and the government. How do you bring agency and power to the subject that everyone else is benefiting from? As it happens, her name was Florence Owens Thompson, she died destitute, and her children never received royalties from those images. That’s where it began. Considering the difficult reality my mother, my grandmother and I were living in, I thought, “Well, wouldn’t it be a great way to honor Florence Owens Thompson by thinking about what her portraits might have looked like had she photographed herself?” And so I ran with that idea. I started as a teenager, and so of course I didn’t have all the knowledge I have now, but it was that concept that gave the work the visual aesthetic of the black-and-white gelatin silver print. It’s the reason why my work looks like social documentary. “There used to be a project complex here, the Talbot Towers. I was born and raised there. Through my photographs I excavate hidden histories.” The Bottom 2009, from “The Notion of Family” (Aperture 2014). You collaborated with your mother and grandmother to make portraits of each other. Why did you want to be in front of the camera? My goal was to find a way to update social documentary, but also to critique it by being the subject myself. So I taught my grandmother and my mother how to make portraits and how to photograph with me. It’s also often assumed that a photographer from the outside is the most knowledgeable person that could photograph someone disenfranchised, and I don’t believe that. So it was about giving that power to my mother to negotiate when we would make those photographs, to direct those photographs, and also for me to scrutinize myself under the lens and be that subject, be just as vulnerable. Because for me, if you’re coming from a privileged institution and talking about theory, it’s empty unless you apply it to everyday reality in a language that people understand. So that was part of the conceptual framework of how I made the work, and why it looks that way. I wanted to show the truth behind how deregulation and an open global market with the steel industry really eroded the environment, which in turn affected our health. But then, more simply, I never had a family album. How often in American culture do people show the photographs that are the truth about what happens when we’re affected by industry, or when we’re affected by economic downturn? We don’t show those kinds of images, how it affects the family. And so I wanted to make this family album that showed all the images that are usually the outtakes that no one wants to show because they’re ashamed. The Notion of Family recently won the International Center for Photography‘s 2015 Infinity Award in the publication category. All images courtesy LaToya Ruby Frazier and Michel Rein, Paris/Brussels.